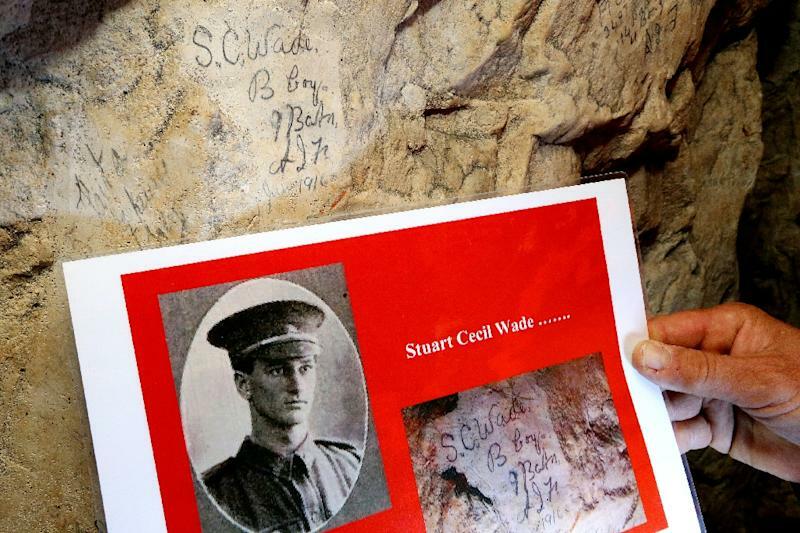 Naours (France) (AFP) - A century after World War I, an archaeologist exploring ancient tunnels in northeast France made a moving discovery -- thousands of scrawlings by Allied soldiers, notably Australians, as they took a break from the hell of the Battle of the Somme. And now, the public can visit them too. "LR Blake lieut 105t How Btry 7-1-17," reads one, with the help of a torch, carved into the vast underground network in the town of Naours, near Amiens. Translation: Leslie Russel Blake, a lieutenant hailing from near Melbourne and fighting with the 105th Howitzer Battery who left his mark on the chalk walls on January 7, 1917. He was to die in battle the following year and is buried nearby. 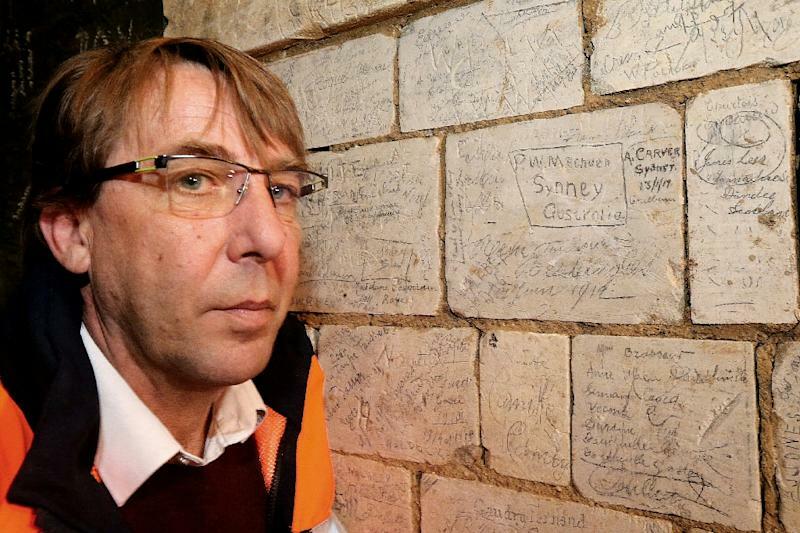 Archaeologist Giles Prilaux has recorded nearly 3,000 bits of graffiti, mostly etched by Australians from the Australian and New Zealand Army Corps (ANZAC). They paint a vivid picture of young men sent to join a war far from home, something Australia celebrates every April 25 as Anzac Day to remember compatriots who served on the Western front, including the 11,000 with no known graves. For the past two years, Prilaux and his colleagues at France's National Institute for Preventative Archaeological Research (INRAP) have painstakingly scrutinised and logged their finds, looking for clues of what life was like on the nearby Somme battlefields. Going was slow with the poor light in the tunnels said to date back to the third century, which also served as a refuge in a much earlier battle, the Thirty Years' War from 1618-1648. Little by little Prilaux's team found signatures, inscription dates, home towns, units and military serial numbers left by soldiers waging the bloody trench warfare that lasted nearly five months and saw more than a million casualties on both the Allied and German sides. "Mostly (they were) done by Australians, but also Americans, British, and some New Zealanders, Canadians and, on occasion, Indians," said Prilaux. Next came the detective work to unpick the identities and stories of the men who had left their mark in the three kilometre-long (two-mile) tunnels. "Identification is a very addictive job," said Prilaux who first came to the caves in 2014 with the goal of determining their age until he started finding the wartime markings. With help from the National Archives of Australia, Prilaux's team was able to determine that Leslie Russel Blake, for example, was born in 1890 in a suburb of Melbourne and died from shrapnel wounds to his forehead in October 1918. Before his death, Blake had been promoted to captain and, during his service with the Australian Field Artillery, was decorated with the Military Cross and a further distinction known as Mentioned in Despatches, according to the Commonwealth War Graves Commission. He is is buried at the Tincourt New British Cemetery, 65 kilometres (40 miles) away from Naours. Another engraving was left by soldier William Joseph Allan Allsop, dated January 2, 1917. Allsop's etching has proved to be crucial in understanding how the caves were used, dispelling the long-established view they were only employed for medical treatment. Cross referencing the infantryman's carving with his wartime diary, Prilaux was able to establish that he "came with several comrades to the Naours caves". 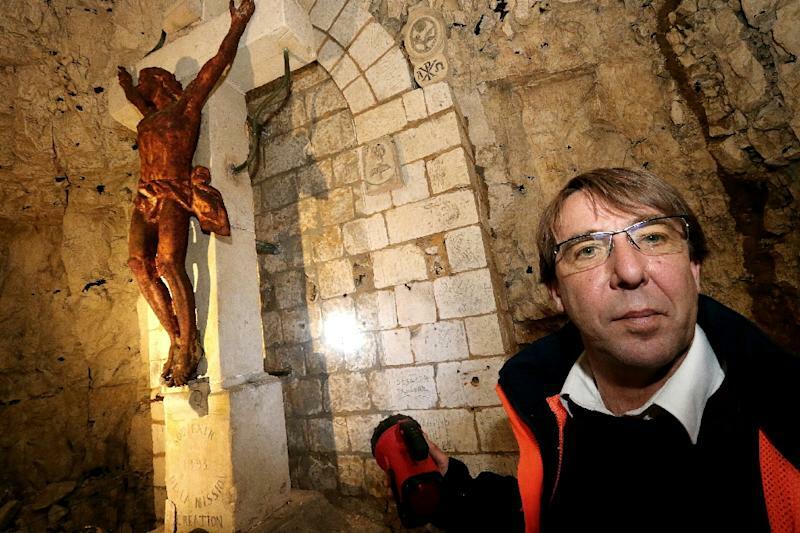 "When I arrived in 2014, it was said that these underground caves had served as a hospital during World War I, but in fact, soldiers stationed in the area visited the underground tunnels for a break from the tumult of the battlefield," said Prilaux. "The fighters spent 15 to 20 percent of their time on the frontline and activities were sought to keep them busy during their free time. A visit to Naours was among the proposals offered as a distraction," said Prilaux. "This was a great discovery." Focus next turned on how to enhance the graffiti's value while ensuring its protection, according to site director Matthieu Beuvin. He and Prilaux decided to leave all as is and open a small stretch of the tunnel to visitors. Last year, 45,000 people came, 40 percent from English-speaking countries. "The inscriptions were all inventoried, photographed and a model of the site will soon be online, as will the identity cards of the authors," said Beuvin, meaning even those in Australia "can visit the site". The site has already moved at least one Australian school group who made a recent "pilgrimage" ahead of Anzac Day, and "half the students ended up in tears", said Beuvin. Another 3,000 Australians were in nearby Villers-Bretonneaux on Monday to mark the 98th anniversary of the battle that liberated that town. The valour shown by Anzac troops has played a role in forging Australian national identity. A fledgling nation at the outbreak of World War I with fewer than five million residents, 416,809 men enlisted and more than 60,000 lost their lives on all fronts, according to the Australian War Memorial.